Massimiliano Allegri is urging Juventus to have no fear when he takes his new side to visit former club Milan in Serie A on Saturday. 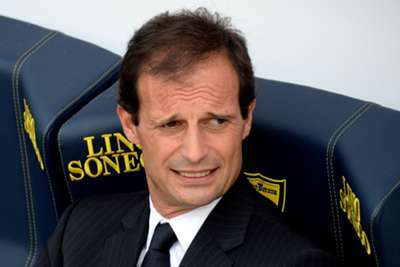 The 47-year-old left San Siro in January this year after a poor run of results saw the club languishing in mid-table. Milan eventually finished eighth under Clarence Seedorf, while Allegri was appointed as Juve boss following the surprise exit of Antonio Conte. Having won three straight Scudetti with Conte at the helm, Juve are looking to Allegri to continue that run of dominance, as well as targeting greater success in Europe after their group-stage exit in the UEFA Champions League last season. Allegri has made a solid start to his tenure, winning each of the opening two league fixtures, but Saturday’s trip to Milan represents a stern test of his team’s credentials. “For me it will be a game like no other – I would not be human if I said otherwise,” he said. “I’m not a machine, I’m a man. “Right now the thing we must do is to not have fear. We are not favourites because I think that they, like us, have prepared for the match and they are preparing in the best way because it is Milan-Juventus. “It will be a fascinating challenge, beautiful as it has always been, in a full stadium and I believe that such a challenge at this time can only be good for Italian football. Like Juve, Milan have also started with two wins from their two matches, with last weekend’s thrilling 5-4 victory over Parma a sign of both their attacking prowess and defensive vulnerability. Now under the leadership of Filippo Inzaghi – who played for both clubs and worked under Allegri at Milan – the seven-time European champions are aiming to return to former glories after a disappointing 2013-14 campaign. “I look at the growth of my team and say that perhaps it would be better to deal with them [Juve] in a few months, when we could have a greater certainty,” Inzaghi said. “Juve are stronger, they have not conceded a goal [in a competitive match] since April 28. We do not know how far behind Juve we are, but we do know where we have started from. “We cannot expect to be at their level, but in a single game a lot can happen. We know of their strength, but we do not go out there already beaten. Juve could be boosted by the return of Arturo Vidal, who is fit enough for at least a place on the bench after a knee injury, although Andrea Pirlo (hamstring) and Andrea Barzagli (foot) are not yet available. For the hosts, new signing Fernando Torres could make his debut after missing the win at Parma with an ankle problem, while Stephan El Shaarawy is also back in the squad after a similar injury. Daniele Bonera is suspended after being sent off at Parma, while goalkeeper Diego Lopez (thigh) and midfielders Riccardo Saponara (knee) and Riccardo Montolivo (broken leg) remain absent.